Trey Edwards is the owner of "the present is" and shares Open Communication through Personal Development Programs, including Life Coaching, Team Building, Motivational Speaking, and Inspirational Listening. 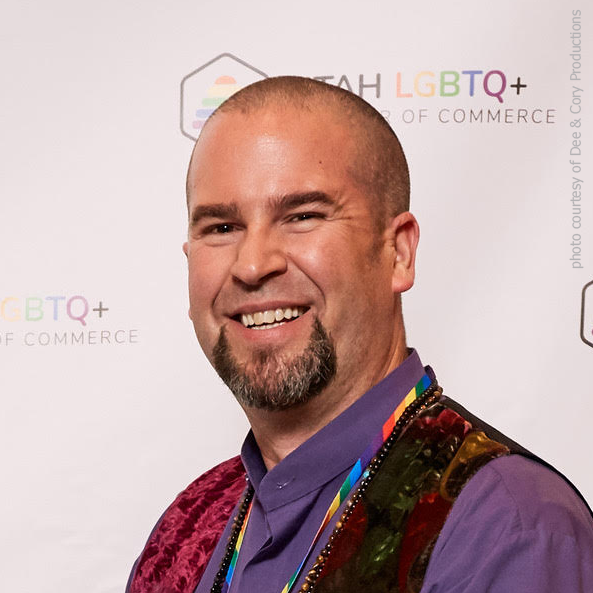 Trey is also a QPR (Question, Persuade, Refer) Certified Suicide Prevention Instructor, and assists the Utah Department of Human Services (Substance Abuse and Mental Health), and the Utah and Salt Lake Suicide Prevention Coalitions, in bringing trainings to groups and businesses throughout Salt Lake County. My passion for the LGBTQ+ Chamber starts with the love and support of my NB Child, Jay. They were able to show me a community of welcoming and supporting individuals and groups that brought me to the Chamber and I'm grateful to give as a Board Member and the SafeZone Chair.